Are you looking for individualized help using QuickBooks, the #1 rated small business accounting software? We meet privately with our QuickBooks training clients, and we will either come to your office or you can come to ours depending on your preference. Our training covers how to enter checks and deposits, set up accounts, and download bank transactions. From there, we’ll work with you to meet your individual needs. We usually start with one two-hour session, let the person being trained work on their own for a while, and then schedule another session (or more if needed) to answer questions and do additional training. 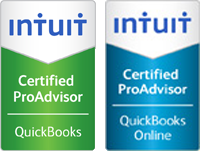 Certified QuickBooks ProAdvisors are experts who have been tested and certified by Intuit on a range of QuickBooks products. Certified ProAdvisors help businesses get the most out of their QuickBooks software, providing a range of services, including: QuickBooks setup, training, payroll and consulting, among others.